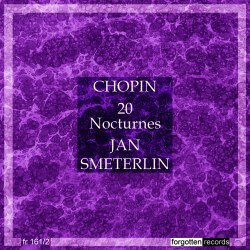 How many Chopin nocturnes can you listen to in one go? My own attention span is normally pretty low, 15 minutes worth of nocturne is quite enough normally - 2 or 3 max. But these performances by Jan Smeterlin are quite something else, because honestly, once you start you can’t stop. They’re the most moreish nocturnes I know, Chopin flavoured Pringles. Why? It’s not because he’s a great colourist, or a flamboyant speed merchant or a pianistic muscle man. Neither is it because he is psychologically deep, nor does he project a sense of a great mind probing the music for its most profound poetry. And he certainly doesn’t make them into piano analogues of Bellini operas. No, he’s a really great musician because he can tell a story - somehow there’s an unfailing logic to the way the music progresses which keeps you strapped to your seat. And in C 19 music this sense of the music’s logic, and the ability to express it in sound, may just be the most important thing. There are two transfers, one on Philips, and the one shown above on Forgotten Records. The Forgotten Records one has significantly superior sound. As far as telling a story goes. Op 48/1 would be the ideal one to listen to. All the Nocturnes are on Youtube. I was just asking myself the same question, when I saw the new Jenny Lin release. Still, we don't have to listen all at once do we, it's not like we're trapped in a middle seat in a concert hall. 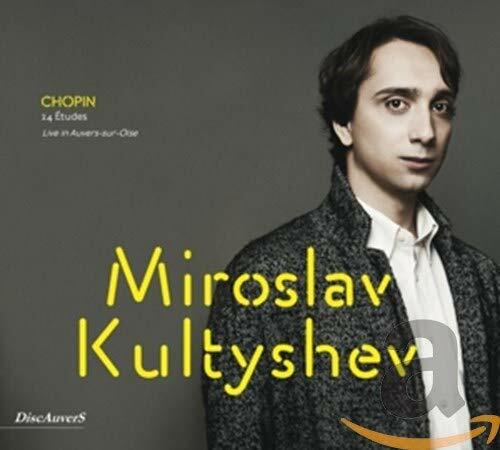 Chopin, Etudes, Kultyshev. Kultyshev can bring the heat. He can also bring the unrest, and the chill, and the silkiness this music needs to fully communicate its potential. Gorgeous. Sonics are outstanding, but noticeably live, with a very slight halo around the notes. Though nothing objectionable in the least. I like the sound very much, which seems quite real, truthful. He's clearly an expressive pianist and I'm not surprised the crowd went wild at the end. Hope I didn't give the wrong impression of the sound. Yes, very nice indeed. I had a listen to a few of these on youtube the other day, and am in absolute agreement with the above. A real find, thank you! I too only ever listen to the nocturnes in small numbers. Same with the mazurkas and polonaises, perhaps a bit more obviously. Is the Forgotten Records on LP only? No it’s a couple of CDs. Thanks for the heads up with Jan Smeterlin. His Chopin I found on youtube though has a rather tinny sounding piano that I usually have a hard time with. All of them and then some. Actually, I can listen to nothing but Chopin all day long. Okay I'll go digging, I don't see any copies on Amazon. Of the Chopin works with a lot of instances from one genre, the Nocturnes are among the most diverse, I think, an encompass a fairly broad range both of musical forms and emotional associations. I'd much rather listen to all the nocturnes and start again from the beginning than to all polonaises or waltzes. Although I have no problem listening to all of the waltzes in one sitting, I would rather not do so twice in a row. Thanks. I will revisit my Philips CDs and see how unhappy I am with their sound. My limit is 3 or 4. It is not Chopin that is the limit. I have a problem with maintaining attention through a sequence of miniatures. Same issue with WTC, Goldberg Variations, Debussy Preludes, etc. 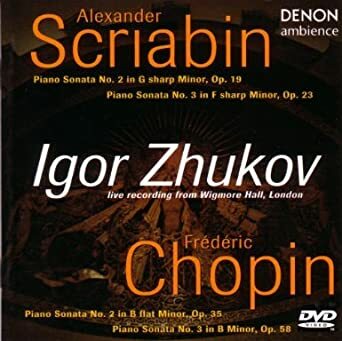 I've been listening to two recordings of the B minor sonata over the past few days, Zhukov in the Wigmore Hall in 1998 and Sokolov in Warsaw in 2013, which I think is that youtube, I've not checked, I have a transfer from somewhere. Both seem to be quite static, Sokolov more so -- Sokolov made me think of some ways of playing late Schubert, the way Radu Lupu plays 894/i for example. In the Zhukov there's more relief, it's more multi-dimensional, though to what extent this is a consequence of the recording I can't say. I think I heard Sokolov play the sonata, I'm not sure, I remember vaguely being disappointed in Toulouse or Lyon by something, maybe that. It's all quite a contrast from the new Pollini, there really doesn't seem to be any consensus about what to make of this sonata. 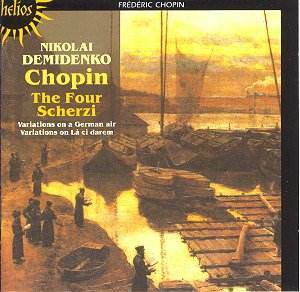 Stupendous set of Scherzos here from Demidenko, restrained, poetic and muscular, with a rich burnished sound from the piano. Fabulous essay in the booklet too, by Demidenko. He argues, yes argues, that all four form a cycle; he uses the precedent of Makuki to justify his pedaling and rubato; he makes inferences from the assumption of Chopin's clacissism to conclusions about the structure of the music. He's got a brain, Demidenko has.